Hello everyone. Well my last post was some days ago now, so I wanted to provide you with a quick update of what I have been doing the last few days in terms of my training. You may or may not be interested (although hopefully since you are reading this you are interested), but writing it down for me is a great motivator to help me continue along the path to long term fitness and weight control. So here goes. My last post was about the Zurich lake crossing, and at the end of that post I mentioned that straight after the 1.5km swim I went to the last of Series 5 of the Wednesday night running sessions, and improved my benchmark run performance compared to 6 weeks earlier. I shaved 11 seconds off my time and went down from 5 minutes 30 at the start of the series to 5 minutes 19 at the end of the series. It helps to have some idea of what the benchmark run was, so I would best describe it as a cross country run, on a mix of grass, sawdust, gravel and asphalt, incorporating a large uphill section and a steep downhill section, and around 1.4km in length. After we completed the benchmark run, Jeff got us to do 40 squats, then another lap of the course, followed by 40 squats (which I substituted for lunges due to lower backache), then one final lap of the course, followed last but not least by 40 bodyweight exercises of our choice. I chose to do press-ups. That was Wednesday's training completed. Thursday I rested and then on Friday evening I had my Pilates class. I was still aching a lot from the gym session on Monday and the swim and benchmark run on Wednesday, so I had to be very careful throughout the lesson to avoid cramps. Several times cramps threatened to take hold and I had to quickly cease the exercise and stretch it out. The muscles threatening to cramp were my quadriceps, my hip flexors, my triceps and the muscles in the arch of my foot. By the end of the lesson I was aching less and feeling a lot more flexible again. After leaving the Pilates class I decided to head straight to the track and do some Yasso 800s. The last time I tried those on the 8th August I managed to do 6 of them. It was clear from the first Yasso 800 on Friday night that I was not going to be able to top that and still walk off the track in one piece. Even the first repetition felt rather hard. I guess it is not too unexpected considering I had just completed a one hour one to one Pilates class and done an extremely heavy gym session at the beginning of the week. So I did 3 Yasso 800s and then called it a night. On Saturday I rested and then Sunday was my long run. My long run the previous week was 15km, so I decided that I would up that by 5km to 20km. I wouldn't really advice people to increase their long run distance that quickly if they are not accustomed to the new longer distance, but although I let my training slip for one month, 20km is still rather short for me. In fact I am even considering to run a couple of times the full marathon distance in training. 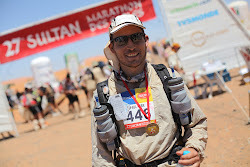 Having run 70km twice in my Marathon des Sables training, 42km does not seem so brutal. Today was time for my second gym session. I wanted to incorporate some more plyometrics into my routine, and true to my word (as I mentioned I would last week) I performed some depth jumps, as well as squat jumps and clap press-ups. I combined that with skipping, some hopping exercises, standing jumps over hurdles and one legged lunges using something similar to TRX Suspension Training technology (but my own improvisation using the equipment that was available in the UBS gym). Then I did some free weight shoulder presses, kettle bell swings, triceps curls, squats, standard press-ups, stationary bike work and rowing on the Concept 2. I am tired even just writing all that down. Unfortunately the UBS gym does not have any boxes of the right height to perform depth jumps. So to start with I improvised by stacking 4 aerobic steps on top of each other, with a further stack of 4 located a few metres away. I jumped off the first stack, landed and then immediately tried to jump up on to the second stack, but it fell over as I landed on top of it and I was very lucky to avoid injury. I was just about to pack them all away and abandon my depth jump attempts, when a quick thinking lady who was also in the fitness room suggested that I make a single high stack against the wall, and jump off that onto the floor then jump up into free air. That worked rather nicely and I was able to complete my planned workout. The plan for tomorrow is most likely a 30 minute tempo run, but that will depend on how I am feeling after my plyometrics and strength training session from today.